Amulets, collars, breastplates and rings made from gold and precious stones... beautiful, luxurious creations whose magical powers must have benefited the persons wearing them. Egyptian civilization is notable for its many material creations left to posterity. Labourers, artisans and artists used all of their expertise to create architectural constructions and objects that now arouse widespread interest and admiration. In creative activities such as jewellery making and stonework the quality of Egyptian products was without equal, with these products the clearest indication of their sophisticated culture and mastery of the different techniques used. With the magical nature of jewellery, the design of which was inspired by divine symbols and entities, the Egyptians hoped to improve or correctly resolve issues relating to life on Earth and the afterlife. Collar. Glazed dough. 18th Dynasty (1550-1307 B.C.). A collar made using various plant items (flowers, various fruits and leaves). Terminals in the shape of a lotus. 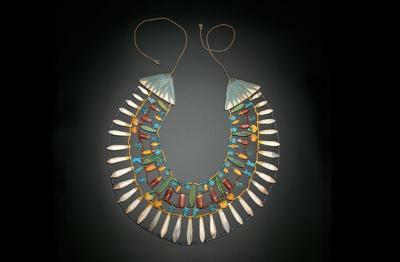 One of the Egyptians’ favourite items of jewellery was a necklace made from denes. Jewels were a clear indicator of the status of the wearer. Thus, the most privileged people could wear jewellery made from gold, silver, carnelian, lapis lazuli, etc., while the less privileged had to be content with items made from glazed dough in colours that imitated more luxurious materials. 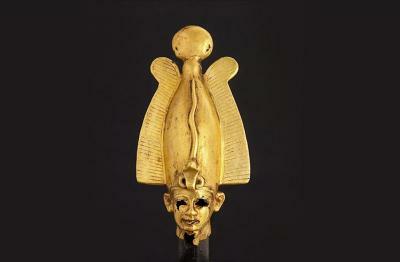 Head of the god Osiris. Gold. Late Period (715-332 B.C.). Gold, silver and electrum were the metals of choice for making jewellery. Due to its brilliance and incorruptibility, gold was associated with the Sun and the concept of immortality (hence the decision to make the bodies of gods from gold). Silver was associated with the Moon, and was used for the bones of the gods. In its natural state or when produced artificially, electrum is a composite of gold and silver. As a result, it assumed symbolic functions. Collar. Glazed dough. The Second Intermediate Period (1640-1532 B.C.). 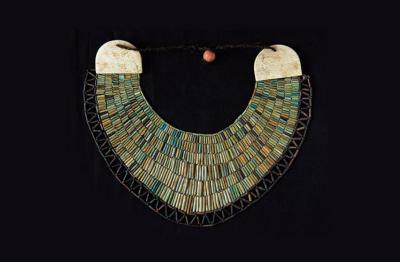 The usekhet collar was the most common design in Egyptian jewellery. 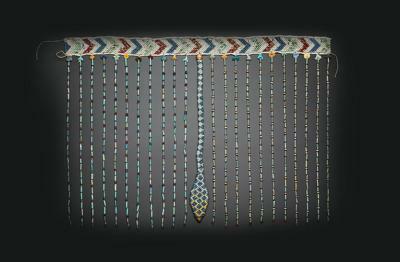 The reconstruction of this piece was based on a collar found in the tomb of the official Wah (11th Dynasty, West Tebes). Ceremonial belt. Faience. The Middle Kingdom (2040-1640 B.C.). 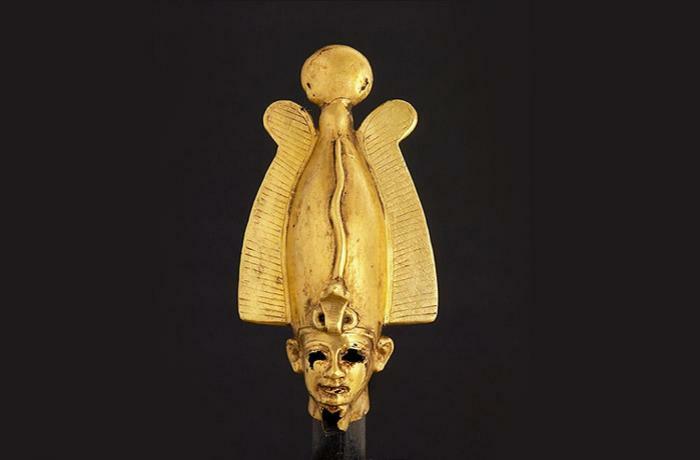 Made with various types of denes and amulets, with one of the jewels located in the tomb of princess Senebtisi in Lisht, dating from the 12th Dynasty and kept at the Metropolitan Museum of Art in New York. Originally, this piece to which the texts refer as a chart, was one of the insignias associated with the pharaoh, although it was later widely used in particular by women in the royal family (such as Senebtisi and Neferuptah, another princess from the 12th Dynasty who had a similar piece among her items with which she was buried). 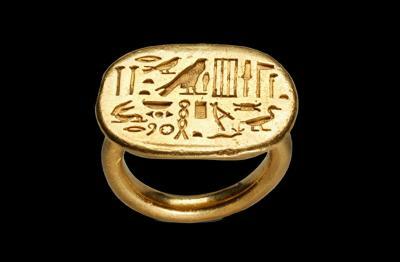 Ring belonging to a person call Sa-Neith. Gold. 26th Dynasty (664-525 B.C.). This is a most unique piece (in terms of the size and quality of execution), of which no more than half a dozen exist anywhere in the world. Sa-Neith held the following titles: ‘Prophet and Divine Father’, ‘Director of Chapels (of the goddess Neith)’, ‘Priest of Horus’, ‘He whose two Diademas are Great’, ‘The Esteemed Priest wen-ra of Ptah’, ‘Sir of the City of Letopolis (in the delta; possibly the city of origin of the owner of the ring)’.